OY-CLL is a highly modified Piper PA-12. The aircraft came out of Germany in the 70’ies where it was groundlooped while towing gliders. In the restoration process, we made the following changes to the aircraft: New fuselage from Dakota Airframes, incorporating a lot of sensible safety improvements like upper fuselage X-brace; cathedral brace behind rear seat; dogleg brace to luggage compartment; reinforced rear fuselage. The new fuselage was thoroughly cleaned, primed with 2-pack polyurethane primer and top coated with white 2-pack polyurethane paint. The control cables have been re-routed underfloor like in the PA-18, so there is a 65 kg. 2-storey capacity luggage compartment. Leather seats with new foam. The wings were rebuilt with new spars, new leading edges, and mostly new ribs. STC’ed flaps were added along with Microair vortex generators. 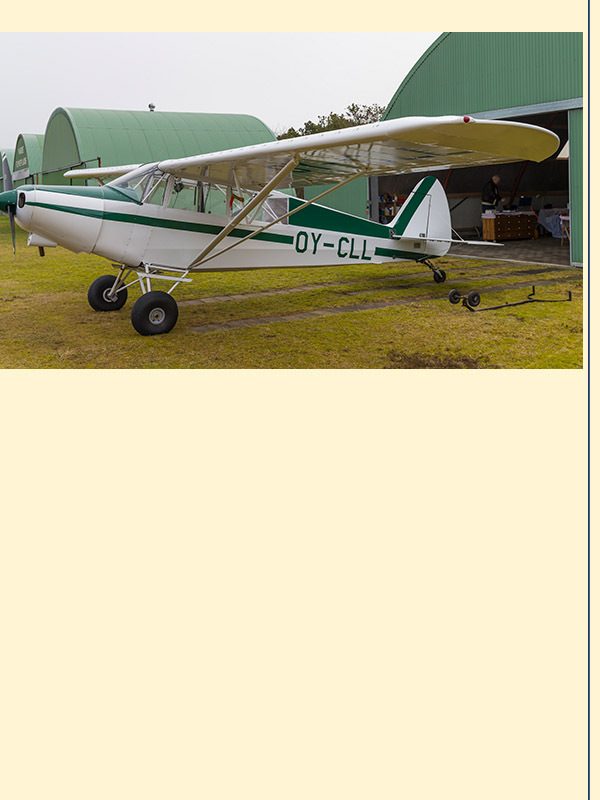 The fuel system was changed to PA-18 tanks as per the Cub Crafters system with no headertanks in the cabin and left-right-both fuel selector. The empennage is PA-18 Engine installation is a newer Lycoming O-320, 150HP. The propeller is a Sensenich 74” metal. Sutton exhaust from ProPilots, Inc. Autofuel permit. Everything electric is new, ie. new wiring overall; new solenoids. Overhauled starter and alternator. Odyssey AGM battery mounted on firewall. New baffling from Airforms Inc., Alaska. New gear legs. New Grove 6” wheels with 22” Aeroclassic Tundra Tires and disc brakes. The Scott brake cylinders have been exchanged for Steve’s Aircraft Brake Boosters. New 6-pack gyro instrument panel with TRIG TY96 COM 8.33 kHz; TRIG TT21 mode S transponder; Trutrak Gemini digital 2-axis autopilot and Garmin GPSMAP 196 in AirGizmo dock. The aircraft was covered using the Superflite System VI.